In the last few weeks I have had the opportunity to see quite a bit of commentary and user feedback concerning the trail system in the Royal Gorge area. It is evident from many of the comments that many people do not really understand what the current status of the trails in the area is and how they will be incorporated into the new trail management plan being proposed by the Truckee Donner Land Trust (TDLT). I thought I would take a step back and offer some information about the trails and explain how the management plan will affect the them. There is a wealth of information available about trail design, much of it from the US Forest Service. A good place to start for those of you that want to learn about best practices in trail management is the trail management presentation that TDLT made last summer as part of their outreach program for the Royal Gorge area. I highly recommend you take a look at this presentation to understand what the intention of TDLT is for managing the Royal Gorge Trails. I would also point you at the US government Recreational Trail Program website for more information. For this discussion, let’s just concentrate on the simple elements involved in the structure of a trail. There have been a lot of claims and rumors circulated in the past few weeks about the types of trails that will be implemented under the TDLT plan. Consider the diagram in Figure 1 which lays out the elements of a flat and sloping trail. Okay, now bear with me on this. The elements that are most important in this discussion are the Trail Corridor and Tread of the trail. The Trail Corridor is the actual width of forest that has to be cleared for the trail to provide sufficient clearance for traffic using the trail. The Trail Tread is the area that the traffic actually passes over. That is it the area where a hiker or equestrian walks on (the footpath) or a mountain bike rides over. The tread is really where the rubber hits the road so to speak and it is the part of the trail that gets the wear. Because it is the tread that bears the load it is this part of the trail that will become naturally compacted and this is the part of the trail that can be strengthened with appropiate fill materials to support heavier use. A good tread will provide a good walking/riding surface and will resist wear and erosion. Now that we have some of the basics under our belt, let’s consider the trail system at Royal Gorge (see Figure 2). Figure 2. 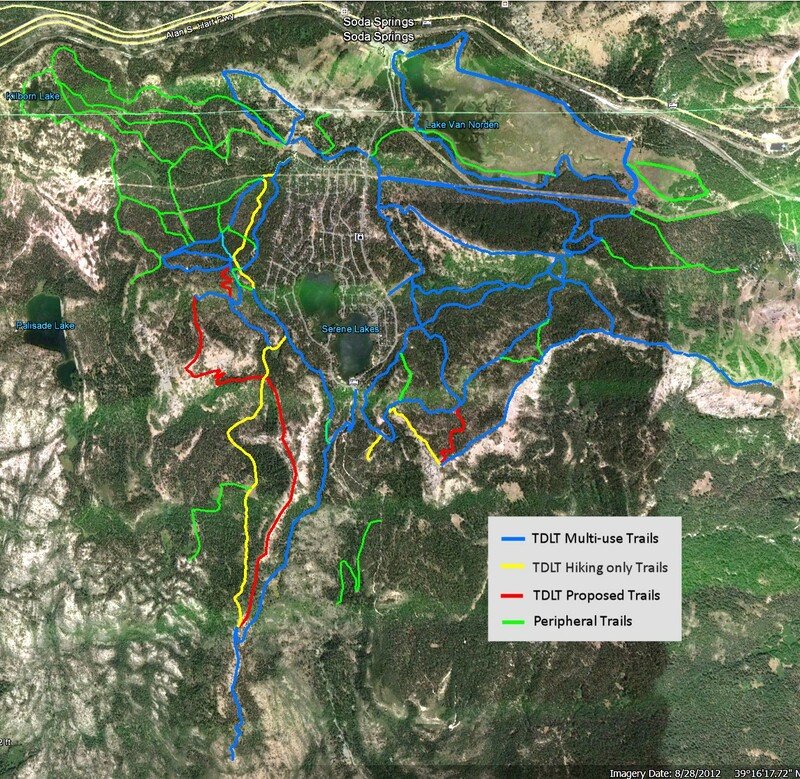 Satmap of Royal Gorge trail system. Trails are color coded to show the different types of trails. It is important to point out the fact that there is already an extensive system of trails in place throughout the Royal Gorge area. These trails are the cross country ski trails of the Royal Gorge ski resort. Many of the trails originated as logging roads that were then turned into ski trails by Royal Gorge. These trails that criss-cross the entire area are not your typical back country trail like the Pacific Crest Trail. Because they are ski trails they have certain requirements. In this day of modern cross country skiing, skiers require that they have groomed trails with tracks for striding and wide surfaces for skate skiing. That requires that these trails have a trail corridor wide enough to allow a grooming machine to pass through the forest. The width required is 20-25 ft. The trails also tend to be pretty straight with long sight lines to better facilitate skiers. Finally, skiing also does not use or affect the tread of a trail because it is covered with several feet of snow. In the summer all of those ski trails become the hiking trails that are used by hikers, bikers and equestrians. Although they were technically on private property, the owners over the years had no problem with people using the trails for non-motorized summer activities. The locals have hiked, biked and rode horses on these trails for decades. The trails, however, are used quite differently for summer activities than in the winter. It is just a natural behavior that people tend to walk/ride down the center of a trail. 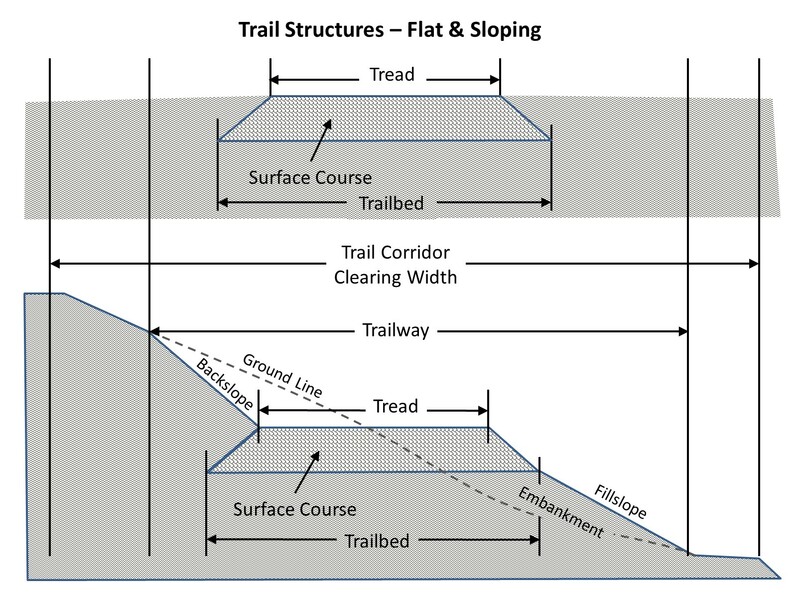 As a result, most trails have a compacted single track tread that runs down the center of the wide 20 ft trail corridor required for ski trails (see Figure 3). The multitude of area wildflowers take advantage of the 8-10 ft borders of the trails and grow up thickly as the summer progresses. 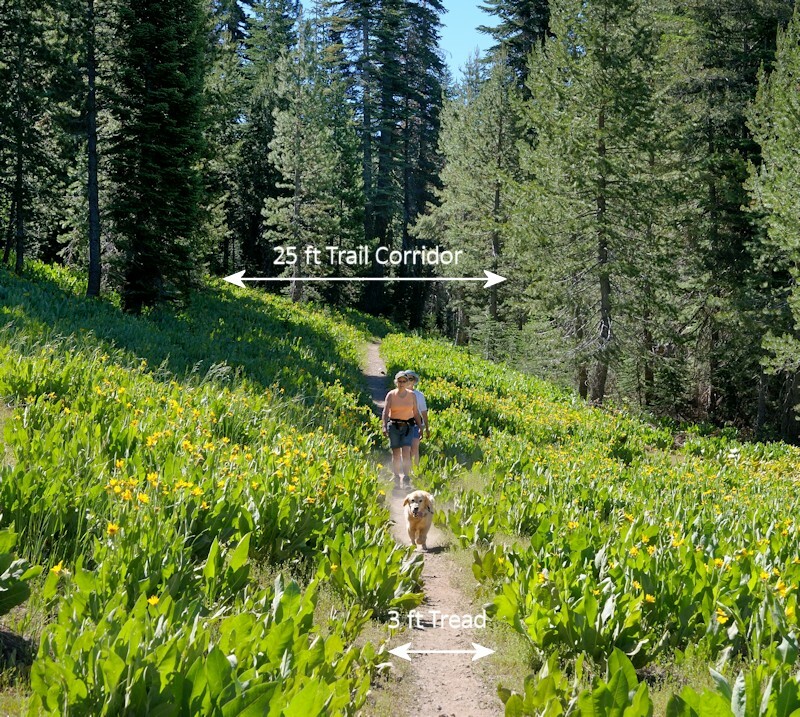 The result is a trail with a 2-3 ft central tread bordered by 8-10 ft areas of wildflowers, bordered by forest (see Figure 3). Figure 3. Switchback ski trail as a summer trail. A single track tread centered on the 25 ft ski trail corridor. It only made sense then, that when TDLT created a trail plan for the area that they would use the existing ski trails. Every time you create a trail you are impacting an area and it requires both money and time. It makes no sense to create a new trail when there is a perfectly good trail already in place. The trail composition for the TDLT plan is shown in Figure 4. Of the 28 miles of trails they have designated as managed trails, 25 miles (89%) of them are existing ski trails. Only 3 miles (11%) of the trails are the typical 6 ft wide single track trails usually used in the back country. TDLT does plan to build about 1-1.5 miles of new trails to provide better access to some area and in some cases correct the detrimental impact of some of the ski trails (the ski trails were not designed using good practices guidelines). This will only represent about a 4% increase in the number of existing trails and these trails will all be of the single track back country variety. While there has been concentrated focus on the trails designated by TDLT for access, it is important to point out that there are a significant number of peripheral ski trails that supplement access by the designated trails. There are an additional 16 miles of peripheral trails (green trails in Figure 3). This additional 36% of trails provides even more widespread access to the property. The relative composition of these trails is shown in Figure 4. The previous posts on this subject have dealt with some of the controversy concerning the use of the trails in the TDLT plan. Much of the controversy deals with multi vs single use. There have, however, been false claims made that TDLT is creating a new trail system that has 25 ft wide trails. It is implied in these claims that these trails are newly created and the treads of the trails are that wide which would of course significantly impact the area. These claims are a distortion at best and just plain misinformation at worst. As stated above, there are only about 4-5% new trails planned and they will all be normal single track back country trails. The existing trails will stay as they are, the only changes being improvements for erosion control. The Royal Gorge area will continue to be used by Royal Gorge ski resort and the ski trails will continue to require a twenty foot trail corridor. I have seen some outlandish proposals that the ski trails be filled in and that new single track trails be built parallel to the existing ski trails. Not only would this be very expensive, it would add significant impact to the area. Figure 4. Composition of trails in the Royal Gorge Area. Shows both TDLT designated trails and peripheral ski trails. If you have ever walked out to Lyle’s Lookout along the Killy’s Cruise ski trail in the middle of summer you know what a wonderful natural experience that can be. As you walk down the footpath in the middle of the trail you can see the Asters, Paintbrush, Columbine and Alpine Lilies growing along the open margins of the trail. If you are lucky, as I have been, you may spot a Pine Marten cavorting in the forest and running along the trail. I don’t know about you, but I really appreciate the added width of the trail corridors of the ski trails that allow for the growth of all those wild flowers. I believe the plan that TDLT has developed to maintain the existing trail system help to preserve that experience for everyone. Thanks so much for the great information!